I wanted to give you alittle background about Reiki, Shamanism and Energy work in general. Reiki is the Japanese technique for stress reduction and relaxation that also promotes healing. It was discovered by Dr. Mikao Usui in the early 1900's. Reiki is administered by "laying on of hands" and techniques such as this have been practicied for thousands of years. Reiki is a very simple yet powerful technique that can be easily learned by anyone. Reiki means universal life energy. If your life energy is low, or if there is a restriction in it's flow, you are more vulnerable to illness. When it is high, and flowing freely, you are less likely to get sick. With reiki you bring balance back to the body through the Meridians and Chakras. The 7 main Chakras transform life energy into the various frequencies our system needs to keep us healthy. Meridians are the pathways that subtle energy flows through within the physical body. They contain energy points ususally referred to as accupuncture points. Shamanism is the earliest spirtual practice known to humankind, dating back tens of thousands of years. It has been practiced in all parts of the world throughout history. The practice of Shamanic Journeying helps us part the veils between the seen and unseen worlds and access information and energies that can help awaken us and restore us to wholeness. A shaman is a man or woman who interacts directly with spirits to address the spiritual aspects of illness, perform soul retrievals, divine information, and help the spirits of deceased people cross over. I incorporate both kinds of energy into my practice on what I feel for that day. Not one energy session for me has ever been the same, even if I am seeing the same person. I do want to point out that energy work has nothing to do with religion for the person who is facilitating. The energy brought into the room is your energy coming from the source that you feel connected with so you can relax, feel comfortable and protected. 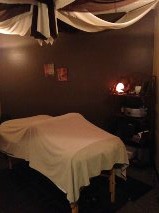 Energy work is extremely enlightening and when incorporated with a massage can be very relaxing.